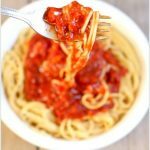 Easy Slow Cooker Spaghetti Sauce–Don’t buy cans or jars spaghetti sauce at the grocery store…make it at home! Make it at home in your slow cooker. It’s super easy and tastes amazing after simmering all day long. Make a huge batch and freeze the leftovers for an easy dinner another night. 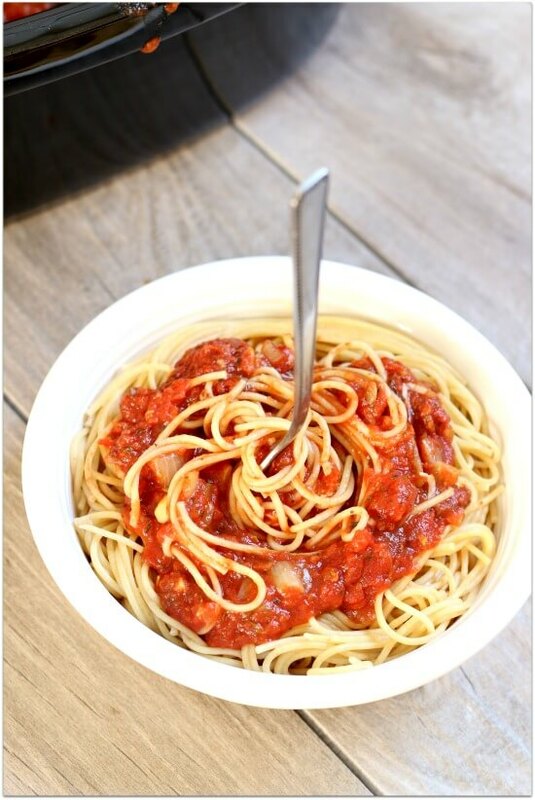 This is a meatless spaghetti sauce but if you want you can easily add in cooked ground beef or ground turkey or Italian sausage. 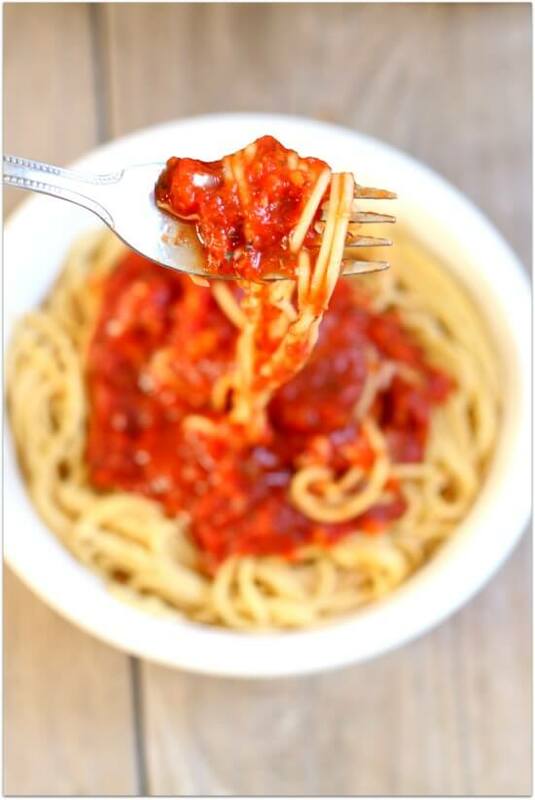 I love all of the Italian flavors in this spaghetti sauce and I love how it tastes even better with more simmering. This is a recipe that you can literally leave on low in the slow cooker for hours and hours. 1. In a microwave safe bowl add the onions, garlic, oil, basil, oregano, rosemary, marjoram, thyme and crushed red pepper. Microwave on high for 5 minutes, stirring every 90 seconds. Add mixture to the slow cooker. 2. Add in sugar, crushed tomatoes, bay leaf, kosher salt, tomato paste and chicken broth. Stir. 3. Cover and cook on LOW for 8-12 hours or on HIGH for 4-6 hours. 4. Add in red wine vinegar and stir. Add extra seasonings to taste. Serve with pasta. Store leftovers in an airtight container in the fridge for up to 3-4 days or in the freezer for up to 2 months. Great spices. Looks fab. 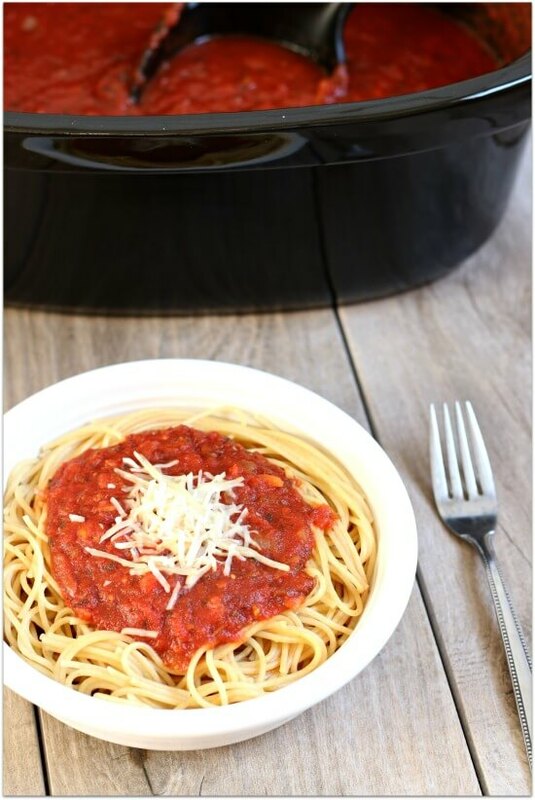 How about slow cook in the Instant Pot. Works good, right? 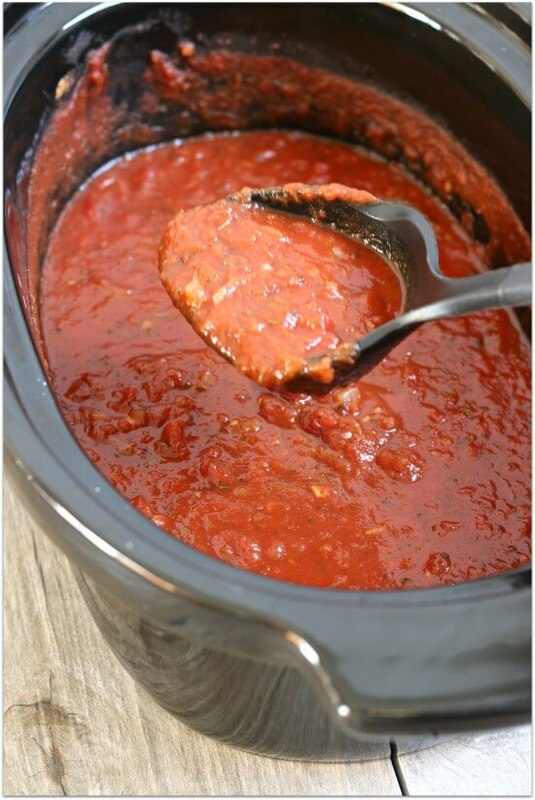 Homemade sauce is the best…we almost always make our own. We have a stash in the freezer for those crazy busy nights! I have yet to make it in the crockpot though…I need to try your recipe! the print recipe command doesn't work in this one! Help!